48 gong-an cases compiled by Wumen Huikai in 1228, with prose and verse commentary. A forty-ninth gong'an by the lay-disciple An-wan (安晚 Jap. : Amban) is usually included. Edited by Zongshao 宗紹 (Jap. : Shūshō). The full title of the work is Chan Zong Wumen Guan 禅宗無門關, and can be translated as The Zen Sect's Gateless Barrier or The Gateless Checkpoint of the Zen Lineage, etc. Chán 禅 is the Chinese source of the word Zen. Zong 宗 means lineage, school, or sect. As the Zen Lineage comes first in the title it is appropriately translated by using the possessive at the beginning or transposing it to the end of the title and using the preposition "of the". Although the short title The Gateless Gate has become fairly common in English, this translation must be rejected upon closer scrutiny. A particular source of criticism is the fact that in the rendering, "Gateless Gate", the word "gate" occurs twice. However, the two Chinese characters being translated here are 門 (mén) and 關 (guān), which are different words and usually have distinct meanings. In order to more accurately reflect this, the translations The Gateless Passage, The Gateless Barrier or The Gateless Checkpoint are used. The character 無 (wú) has a fairly straightforward meaning: no, not, or without. However, within Chinese Mahayana Buddhism, the term 無 (wú) is often a synonym for 空 (sunyata). This implies that the 無 (wú) rather than negating the gate (as in "gateless") is specifying it, and hence refers to the "Gate of Emptiness". This is consistent with the Chinese Buddhist notion that the "Gate of Emptiness" 空門 is basically a synonym for Buddhism, or Buddhist practice. 門 (mén) is a very common character meaning door or gate. However, in the Buddhist sense, the term is often used to refer to a particular "aspect" or "method" of the Dharma teachings. For example, 法門 ("fămén") refers to a "Dharma method"; 禪門 ("chánmén") means the "method of meditation". Reading 無門 ("wúmén") in this sense of "the method of not / emptiness" is also in conformity with the text itself, where the first passage describes how to practice the "method of wú", "What is the checkpoint of the Patriarchs? It is just this character "wú", that is the single checkpoint of the (Chán) school" (如何是祖師關。只者一箇無字。乃宗門一關也). This is also the meaning given by Mazu of Hongzhou (洪州馬祖) (according to Zongmi's Records of the Mirror of the School 宗鏡錄), "No method is the Dharma method, is also said to be the emptiness method (無門為法門。亦名空門)..." (T48, no. 2016, p. 418, b13-21). In modern Chinese, 關 (guān) is most often a verb meaning to close, but it also functions as a noun with the meaning of checkpoint, such as a customs house or a fortress guarding a mountain pass. This implies the literal translation checkpoint without a gate. As a checkpoint is something that can be either closed, functioning as a barrier, or open, functioning as an entry point, this title may be taken to have a double meaning: does "without a gate" mean that the barrier has no gateway through which to pass, or does it mean that the passage has no gate to block it? One should also note that, as the author of the collection was named Wumen (which could mean either the literal gateless or the figurative gate of emptiness), Wumenguan could also be read as simply, The Checkpoint of Wumen. This corresponds to the passage in the opening of the text, "Just as the General seizes the checkpoint, with a great sword in hand" (如奪得關將軍大刀入手). The text was originally prepared by Wumen as a record of his teaching during a monastic training period held at Longxiang (Soaring Dragon) monastery in the summer of 1228. Wumen selected the 48 koans and commented on and added a verse for each koan. His teachings were transcribed and after the training period were compiled into the collection called the Wumen Guan. As was customary in China at the time, an edition might have additions of text inserted by a subsequent owner or publisher. The most well known version of the text is from the Japanese wood block edition made from the 1246 manuscript edition that contains the following sections. An untitled introduction by Xi Xiang (習巷), publisher of the 1228 edition, written in the self-deprecating style of Zen humor. An untitled dedication by Wumen to the Emperor and Empress. Works without such dedications were subject to Imperial censorship as being seditious. An untitled foreword by Wumen followed by a verse on the title. A table of contents with the title of each koan. However, the koans are unnumbered in both the table of contents and the body of the text and there are no page numbers in the text, so the table of contents is just the list of the koan's titles in order of appearance. The 48 koans presented in four parts consisting of (1) a title composed of four characters, (2) the body of the koan beginning with the name of the protagonist of the case, (3) a comment beginning with the words "Wumen says" (無門曰), and a verse beginning with the words "The ode says" (頌曰). An untitled afterword by Wumen that ends with the words "The end of the volume the Gateless Checkpoint." An appendix believed to be written by Wumen titled "Zen Caveats" or "Zen Warnings"" consisting of twelve one-line aphorisms about Zen practice written in the style of Zen contrariness that points to not falling for either side of dualistic thinking. For example, Zen is known as the school of Buddhism that does not stand on written words and one caveat says, "Neglecting the written records with unrestrained ideas is falling into a deep pit." An appendix titled "Huanglong's Three Checkpoints" (黄龍三關) written by Wuliang Zongshou (無量宗壽) in the late spring of 1230 C.E.. Huanglong Huinan (J. Oryo Enan), 1002-1069. was a Zen master who promulgated three questions as one-line koans: "Everyone exists by a particular cause of birth. What is your cause of birth?" "How is my hand like the hand of Buddha?" "How is my leg like the leg of a donkey?" Wulaing wrote four four-line stanzas (Sanskrit gathas ). Each of the first three stanzas comments on one of Huanglong's three questions and the fourth stanza is a summation. Wulaing writes that he penned the four verses to thank and commemorate Wumen's recent stay at Ruiyan (瑞巖)(Lucky Cliff) monastery where Wumen was the visiting head teacher for the training period. A short untitled addendum by Wuan written on the republishing of the work in the summer of 1245 C.E. Wuan called his brief addition the 49th case. It referred to Bodhidharma 's famous Zen motto: "Not maintaining written words, but pointing directly to the human heart-mind to see one's own nature to become Buddha". An undated postscript by Menggong (孟拱) consisting of a very brief story of a military ambassador who used his army as farmers to reclaim a wasteland and thus pacify the region. This appears to be a metaphor for the practice of Zen. An appendix by Anwan dated the beginning of summer 1246, presented in the same format as one of the 48 main koans and consisting of (1) an untitled introduction, (2) a title, "Younger Brother's 49th Standard Talk", (3) the body of the case, (4) a comment beginning with "Anwan says", and (5) a verse beginning with "The ode says", followed by Anwan's signature with the place and date of the writing. Zen and Zen Classics, Vol. Four, Mumonkan, Tokyo: Hokuseido Press. 1966, 340 p.
Wisdom Publications, Boston, 2004, 336 p.
in Zen Flesh, Zen Bones, pp. 109-161. The most comprehensive collection available of Nyogen Senzaki's brilliant teachings, Eloquent Silence brings new depth and breadth to our knowledge and appreciation of this historic figure. It makes available for the first time his complete commentaries on the Gateless Gate, one of the most important and beloved of all Zen texts, as well as on koans from the Blue Rock Annals and the Book of Equanimity. Amazingly, some of these commentaries were written while Senzaki was detained at an internment camp during WWII. 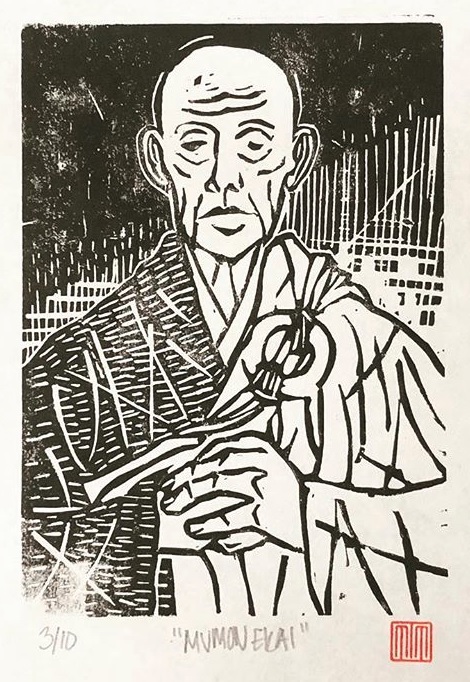 Also included are rare photographs, poems reproduced in Senzaki's beautiful calligraphy and accompanied by his own translations, and transcriptions of his talks on Zen, esoteric Buddhism, the Lotus Sutra, what it means to be a Buddhist monk, and other subjects. Roko Sherry Chayat has edited Nyogen Senzaki's words with sensitivity and grace, retaining his wry, probing style yet bringing clarity and accessibility to these remarkably contemporary teachings. Numen, Vol. 25, Fasc. 1. (Apr., 1978), pp. 65-76. This paper attempts something which at first might seem unusual, that is, to analyze a collection of Zen koans. According to some scholars of Zen, the koan "cannot be understood by logic; it cannot be transmitted in words; it cannot be explained in writing; it cannot be measured by reason" 1 . This seeming contradiction touches upon a basic problem encountered in trying to understand the religious conceptions of another culture. For a religious understanding of koans (by Zennists) there is no need for explanation, indeed there is no way a koan can be analyzed. The intention of the koan is to bring about a state of enlightenment, devoid of conceptualization, beyond the realm of words and even thought. However, for an academic understanding of koans we can, and should, analyze them in order for non-Zennists to comprehend their function and purpose in Zen. We shall return to this point a little later, but first let us explain what constitutes a koan. Koan is the Japanese pronunciation of the Chinese characters kung an, which mean "public record". These characters were used by Buddhists to signify, "'a public document setting up a standard of judgement', whereby one's Zen understanding is tested as to its correctness" 2 . Theoretically koans may take any form, but the most common consists of questions and answers (mondo; wen fa), stories or statements 3 . One of the most famous koans is in the form of a mondo, "The Master Jyoshu was once asked by a monk, 'Has a dog also Buddha-nature or not? Jyoshu said, 'Mu ! ' " 4 Mu (wit) was the character used by Zennists to translate the sanskrit word sunyata, meaning "emptiness" or "devoid of self-nature". However, even with this explanation of mu, the koan appears meaningless to non-Zennists, and many seem to think that the "key" to understanding Zen lies in uttering nonsense. Needless to say, this is not the case. For this analysis, we are going to consider koans as means of communicating a particular understanding of reality, the Zen understanding. By means of koans, Zen Masters are able to convey the most important ideas, attitudes and conceptions of Zen Buddhism. "The koans do not represent the private opinion of a single man, but rather the highest principle, received alike by us and by the hundreds and thousands of bodhisattvas of the three realms and the ten directions" 5 . 1) If there is a meaning to be found in mythology, it cannot reside in the isolated elements which enter into the composition of a myth, but only in the way those elements are combined. 2) Although myth belongs to the same category as language, being, as a matter of fact, only part of it, language in myth exhibits specific properties. 3) Those properties are only to be found above the ordinary linguistic level, that is, they exhibit more complex features than those which are to be found in any other kind of linguistic expression 6 . 1) The meaning in koans does not reside in the isolated elements, i.e., the questions and/or answers, but in the way these elements are combined. That means the simple questions and seemingly irrelevant answers are not as important as the reason for giving a seemingly irrelevant answer to a seemingly simple question. 2) While koans are a form of language, they do exhibit specific properties which enable us to recognize them. 3) The importance of koans is not to be found in the words or actions used, but above the ordinary linguistic level. By comparing an approach to koans and myths, I do not mean to imply that they are the same thing; however, I do think that one might use a similar methodology to facilitate an understanding of both koans and myths. Cultures use various means to communicate their understandings of reality, some use myths, some use laws and regulations. The Zen Buddhists used koans as one means of transmitting their particular ideals, and as such, they are suitable subjects for our analysis. Before presenting the analysis of the koans in the MuMon K wan, I would like to give a brief history of the koan in order to place this aspect of Buddhism in perspective. Zen is the Japanese pronunciation of the Chinese character chan which is, in turn, a transliteration of the Sanskrit word dhyana which means "meditation". This sect of Buddhism places greater emphasis on personal religious experience acquired through meditation than on scripture; however, this does not mean that they reject scripture. The goal of Zen is enlightenment or satori, which is the. goal of all Buddhist sects. Since this enlightenment involves the ability to see things "as they really are" i.e., without conceptualizations, the Zennists believe that the dependence upon words and conceptions should be curtailed - thus their dependence upon meditation. The koan system was developed among Zen Buddhists as a means of facilitating the attainment of satori through meditation. One should understand that the koan is not an object on which the Zennist meditates in order to reach satori; rather, it is a device. to "develop artificially or systematically in the consciousness of the Zen followers what the early masters produced in themselves spontaneously" 7 . This consciousness is devoid of conceptualization and dichotomization, and thus the koan cannot be seen as an object of meditation. To meditate on the words of a koan is an error; rather, one should meditate in order to prepare oneself for realization of that which the koan exemplifies. Prior to the development of the koan system, this consciousness of ultimate reality (satori) was transmitted by means of questions and answers (mondo) between Masters and students. Students were expected to ask questions of the Masters in order to progress along their spiritual path. When the students had no questions, the Masters would try to raise them in their minds; in order to do this, there developed a group of stock questions. One of the most popular questions asked by pupils was, "Why did Bodhidharma come to China?" i.e., what is the teaching of Zen (Bodhidharma brought Zen teaching to China). The masters, in turn, most frequently asked the students how they came to the monastery. "'Whence comest thou?' was not a question prompted by mere curiosity; for if we really know the whence and the whither we are already masters of Zen" 8 . The 'most radical change in the use of the koan system came when Masters stopped using koans they themselves had created and began using those of past Masters. According to Ruth Fuller Sasaki, Nan-yüan Hui-yung (Nan'in Egyo, d. 930) questioned one of his disciples about the formulas of Lin-chi (Rinzai Gigen, d. 866) and thus, "Koan Zen, or the use of the words of earlier masters in a fixed and systematized form to instruct or test a student, may be said to have truly begun" 9 . Suzuki names four circumstances which led to the rise of the koan system in Zen. The first was the aristocratic nature of Zen, which had to be curbed if it was to continue as a viable sect. "Aristocratic Zen was now turned into a democratic, systematized and, to a certain extent, mechanized Zen" 10 . Second, several hundred years after the time of the sixth patriarch, Hui-neng (Eno, 638-713), Zen lost some of its originality and had to be renewed in order to stimulate the development of Zen consciousness. The koan, as a means of developing this consciousness, gave new life to the Zen movement. Third, after hundreds of years of development, various "scriptures" began to accumulate among Zennists, The sect which emphasized meditation over scripture began to create its own scripture about meditation and thus invited a process of intellection. If the Zennists thought about past Masters and their doings rather than trying to find satori themselves, then the spirit of Zen would suffer. The koan, as a means of breaking students away from the process of conceptualization, was a means of curbing this intellection process. Fourth, quietism, the opposite of intellection, also became more prevalent in Zen. Thinking that speech, as a process of conceptualization, was detrimental to the attainment of satori, many monks rejected all forms of communication and preferred to sit quietly, contemplating their existence. This type of Zennist forgot that words, even though they may be conceptualizations, w-ere nevertheless necessary for a proper understanding of the purpose of Zen. Koans, being words which lead one to the goal of satori, would serve to dispel this false notion of quietude 11 . The rise of the koan system, thus can be seen as a logical outgrowth of the philosophy behind Zen. As such, koans are a middle path between the two extremes of intellection and quietude. The Mu Mon Kwan or Mumonkan is a collection of forty-eight koans compiled by the Master Wu-men Hui-k'ai (Mumon Ekai, 1183-1260). In the preface, the author states the time and purpose of the work. In the summer of Jyotei I (1228) I was head of the monks at Ryusho monastery in eastern Ka. When they begged me for instruction, I took up the koans of the ancients to make them serve as tiles for knocking at the gate. In guiding each student in accordance with his type, I have noted koans at random which became, without plan, a good collection. There are forty-eight of them, but I have not arranged them in any order. I call the collection the Mu Mon Kwan 12 . This collection was brought to Japan In 1254 by Shinchi Kakushin, a pupil of Wu-men. For this analysis I have used the English translation by Sohaku Ogata 13 . The first problem in the analysis consisted of organizing the koans. As stated above, Wu-men did not arrange them in any specific order. At first I thought of organizing them according to the eighteen kinds of questions given by Shan-chao of Fen-yang in Suzuki 14 , but this did not prove fruitful because these questions were only those asked by pupils of Masters, while the Mu Mon Kwan contains questions asked by Masters of pupils and koans which do not contain questions. Because of my limited knowledge of the traditional interpretations of the individual koans, I could not classify them according to the five types given by Sasaki 15 or the eight types given by Ogata 16 . Therefore, I devised my own system of classification, in order to single out common elements in the various koans, After detecting the common elements, I can begin to examine them in order to try and understand the important conceptions represented by the various koans. The system has two main parts. The first deals with the form of the koan and the second deals with the purpose or example stated in the koan, The first part has three main divisions; I. Questions (which mayor may not have answers), II. Statements Given by Masters (which may be either verbal or non-verbal) and III. Stories (more than one question or statement given in a narrative form). I have further divided the first part into three sections; A. Questions Asked by Pupils of Masters: this includes I. Anonymous Pupils and Named Masters and 2. Named Pupils (possibly future Masters) and Named Masters. B. Questions Asked by Masters of Pupils. This can be of four types; I. Pupil(s) Anonymous - Masters Named, 2. Pupil(s) Named (possibly future Masters) - Masters Named, 3. Named Masters who ask questions in order to find a successor or Master among pupils, and 4. Questions asked by a Master which are without answers. C. Questions asked by Masters of Masters. This classification, together with the numbers of the koans which are included in each category is given in Table I. The second part of the classification system deals with the purpose or example stated in the koan, i.e., its relationship to enlightenment. A. A Question, Statement or Story Which Results in Enlightenment. B. A Question, etc., Which Exemplifies Enlightenment (both parties are recognized as enlightened). C. A Question, etc. Which Shows the Enlightenment of One Party. D. A Question, etc., Which Shows the Unenlightenment of One Party. This classification is given in Table 2. 1. Pupil Anonymous — Master Named: 1, 7, 9, 18, 21, 24, 32, 33, 37, 48. 2. Pupil Named — Master Named: 19, 23, 28. 1. Pupil(s) Anonymous — Master Named: 2, 11, 14, 15, 35, 39. 2. Pupil Named — Master Named: 2, 15, 41. 3. Asked to Find New Master or Successor: 40. 4. Questions Without Answers: 4, 5, 8, 16, 20, 36, 38, 39, 43, 45, 46, 47. 10, 11, 14, 22, 30, 42. A. Verbal: 3, 6, 12, 17, 20, 25, 26, 28, 31, 34, 44, 46. 2, 3, 5, 6, II, 13, 14, 23, 28, 31, 32, 39, 42, 46, 47, 48. A. Resulting in Enlightenment: 2, 3, 7, 15, 19, 28, 41. B. Exemplifying Enlightenment: 10, 11, 14, 40. C. Shows One Party's Enlightenment: 1, 2, 3, 4, 5, 6, 8, 9, 10, 12, 17, 18, 19, 20, 21, 22, 24, 25, 26, 27, 28, 30, 32, 33, 34, 35, 36, 37, 39, 40, 41, 42, 43, 44, 45, 46, 47, 48. D. Shows One Party's Unenlightenment: 11, 14, 26. From the repetition of numbers in both tables, we can see that many of the koans, not just those designated as "stories", contain two or more parts. One koan may ask several questions of different types, or of the same type, and questions may be mixed with statements. In Table I we can see that, in general, the most common form of the koan in the Mu Mon Kwan is the question, and that the most common forms of questions are either those asked by anonymous pupils or by Masters where the answer is not given. Statements given by Masters are next in occurrence with verbal statements being far more prevalent than non-verbal statements. We can also see that koans in the form of stories constitute one-third of those given. The numerical differences between the four most common types are so slight, and the differences between these four and the rest of the types are so great, that we can safely conclude that the most common, and therefore, most important types of koans for our analysis are 1. Stories, 2. Verbal Statements, 3. Questions Asked by Anonymous Pupils and 4. Questions Without Answers. We can assume that the story koans are merely literary devices and have no intrinsic value due to their form. Of more importance, are the questions and statements contained in the stories, so we will concentrate our attention on these. In the first group, questions by anonymous pupils, we see that two types of questions are asked. The first type is rather simple, as would be asked by a novice 'monk. In koan 7, a novice asks "Will you please instruct me, master?" In koans 18, 21 and 33, the Master is asked "What is Buddha?" And in koan 37 the question is, "What is the meaning of Bodhidharma's coming to the Wiest?" The second type of question indicates a more advanced level of achievement in which the fine points of doctrine are puzzling students. These are such things as; "Has a dog Buddha Nature or not?" (1), "Since both speech and silence are concerned either with affirmation or negation, how can we avoid violating (the way in which Truth manifests as such)?" (24), or "Is there any teaching which you have not yet preached to others?" (27). The important thing to note here is that the answers given to both types of questions are basically the same. When asked "What is Buddha?" the Masters reply, "Three catties of hemp" (18), "A dirt-cleaner" (21) or "There is no mind, no Buddha" (33). When asked if there is any other teaching, Master Nansen replied, "Yes.... It is neither mind, nor Buddha, nor a thing" (27). When asked about the problems inherent in speech and silence, Master Fuketsu replied, "I always think of the view of the south river in March, when birds are singing and flowers are at their 'best" (24). From this we can conclude that these koans tell the student that enlightenment does not depend on the type of question asked, nor one's proficiency with doctrines or sayings of the Masters; rather, enlightenment depends on one's ability to perceive that to which the Master's answer points. The monk in koan 24 who asked the complex question about speech and silence was shown to be a fool by the Master, while the novice in koan 7 was immediately 'enlightened after his simple request for instruction. This teaches the students that they should not dwell on the words of the koan in order to attain enlightenment, but on non-acceptance of conceptualization exhibited by the Master. One does not need to be a scholar in order to divest oneself of conceptualization and dependence on dichotomies. Satori is nonconceptual and non-dual, and cannot be attained until one releases oneself from these errors. The same types of concepts arc exemplified in the other two types of koans, questions without answers and statements by Masters. In koan 4, Master Wakuan asks, "Why has the barbarian (Bodhidharma) from the western heaven (India) no beard?" This question is not consistent with our conceptualizations because Bodhidharrna was almost always shown, in works of art, with a beard. Koan 46 tells us that the true man should not be content to climb to the top of a hundred-foot pole, but should climb a step above the top of the pole. In koan 38, we are given an illustration, "A water buffalo is going out through a window. Her head, horns and hoofs are through but her tail cannot pass. Why is this?" And the Buddha, in koan 6, tells us after holding up a flower, that, "I have in my hand the doctrine of the right Dharma which is birthless and deathless, the true form of no-form and a great mystery. It is the message of non-dependence upon (words) and letters and is transmitted outside the scriptures". These koans give the student the same message, that satori is not to be found in conceptualizations, and that one must break away from dependence upon conceptions in order to see things "as they really are". Let us now turn to the classification of Table 2, in order to see the relationship of the koans to enlightenment (satori). We can see that the most common type is C., which shows the enlightened nature of one party in the koan, It is interesting to note that the koan which ends by saying "so and so was then enlightened" is not the most common, Likewise, koans which show the verbal banter of two enlightened persons, and the koans which show unenlightened persons are not the dominant form. From this information, we can conclude that emphasis is not placed on immediate enlightenment after a meeting with a Master, the verbal interplay of those who are enlightened or the condemnation of those who are not enlightened. Rather, the student is told, through the koan, that there are persons who are enlightened and they wish to help those who are not. In this way, immediate enlightenment after a short period of training (which would certainly be rare) was played down, as well as the seemingly boastful interplay of enlightened beings and the rebuking of those who are not yet enlightened. The student was given a goal, which could be attained (the enlightenment of the Masters shows this) but cautioned that this attainment might take a long time. Furthermore, once a person was enlightened, he should not waste time showing off this enlightenment; rather, one should use the insights gained by enlightenment in order to help others gain satori. Before concluding, I should like to deal with one of the problems mentioned at the first of the paper, i.e., the difficulty or even inappropriateness of trying to analyze koans, I said that, according to Buddhists, a koan "cannot be understood by logic ... it cannot be measured by reason" 17 . If, as we have seen, koans reject conceptualization and seem to defy logic and reason; how can we hope to analyze them? The problem here is a methodological one, involving the dispute between the adherent to a particular religious tradition and an outside interpreter. As a religious device, the koan cannot be interpreted, this would lead to the error of intellection 18 , of trying to find the truth in the words and concepts of the koan rather than viewing the koan as a "tile with which to knock at the gate (of reality)" 19 . This attitude towards koans is suitable for Zennists; however, for non-Zennists trying to understand the purpose and function of koans, this attitude is not suitable. The historian of religions should not be interested in gaining satori through the academic study of koans: if this were the case, then, as we have seen, they would fall into the error of intellection. The purpose of the historian of religions should be to achieve an understanding of the various components of a religious system in order to appreciate that system as a whole, and then (possibly) compare it with other systems. The analysis presented here attempts to fulfill that purpose. Not to understand these koans for the sake of personal enlightenment; rather, to gain an understanding of how Zen Buddhists utilized the koan system in order to enlighten themselves. In other words, to find the function of the koan system as a means to achieve a religious goal - enlightenment. Thus, one can justify such an analysis for an historian of religions while one cannot justify it for a Zennist, With this in mind, let us look at what conclusions can be drawn from our analysis. From the information gained by the classification shown in Table I, we have seen that, although the form and content of the various koans in the Mu Mon Kwan differs greatly, the koans all seem to carry the same message to the Zennist. That is, that the way to satori is not through dependence upon words, even if they be words of the Buddha or past Masters; however, one should not reject words, for, imperfect as they are, they are the only means we have of attaining enlightenment. They should use the words and ideas contained in the koans to reach satori, but they should never confuse the two. Conceptualizations, words, logic and reason are means whereby one attains enlightenment, but they must not be equated 'With enlightenment. "The koan is useful as long as the mental doors are closed, but when they are opened it may be forgotten" 20 . We have seen from the structure of the koans that a question, no matter how skillfully asked, will be met with a seeming absurdity or contradiction as long as the student still holds on to conceptualizations. This idea is communicated to the student by means of the attitude exemplified in the koans, If this were bluntly stated, the student would merely accept it as a fact, an entity to be memorized and handed down. By means of the koan, Zen Masters are able to transmit this message to their pupils in such a way that they might realize the truth for themselves rather than relying on someone else's realization. The religious attitude of Zen is thus transmitted by means of the koans, while at the same time teaching the student not to dwell on the words or actions used. The message of the Buddha is very subtle, and requires a very subtle means of communication. We have also seen that, according to the information gathered by the second classification system, Table 2, the end product of enlightenment is the transmission of enlightenment to others. The enlightenment of one being is useless without the enlightenment of all beings. The vast majority of koans in the Mu Mon Kwan show that satori can be achieved, and that it should be exhibited, not in the condemnation of those who are not yet enlightened, but in the actions and attitudes of the Masters who have reached satori. The koans also show that quick enlightenment is not the usual case, rather, one must work hard to break the bonds of conceptualization in order to see the "right Dharma which is birthless and deathless, the true form of no-form and a great mystery" 21 . The koans we have examined thus serve the function of correcting the two errors of intellection and quietude. They use words and actions to show that words and actions are conceptualizations which should be understood as such in order for one to attain enlightenment. 1) Ruth F. Sasaki, "The History of the Koan in Rinzai (Lin-Chi) Zen". F. Sasaki, New York: Harcourt, Brace & World, Inc., 1965 p. 5. New York: Samuel Weiser Inc., 1970, p. 93.
the West. S. Ogata, New York: Dial Press, 1959, p. 91. Garden City: Doubleday & Co., Inc., 1967, p. 206. 11) Ibid., pp. 90-1 I I. 17) See p. 66, above. 18) See Suzuki., pp. 91-93. 19) See Mumon., p. 91. Two Zen classics : the Gateless gate and the Blue cliff records / translated with commentaries by Katsuki Sekida ; edited and introduced by A. V. Grimstone. Boston, Mass. : Shambhala : 2005. 413 p. Originally published: Weatherhill, 1995. English Translation by late Zen master Katsuki Sekida (Two Zen Classics, pp. 26-137.) Modified by JOKB (Japanese-style expressions replaced by Chinese-style). The Chinese and Japanese texts in this web site are taken from the book titled Wumenkan, published in Japan by Iwanami Bunkō. in: Zen for the West by Sohaku Ogata (London: Rider & Company, for the Buddhist Society, London, 1959), pp. 78-133. Aitken, Robert, trans. The Gateless Barrier: The Wu-Men Kuan (Mumonkan). New York: North Point Press. 1990. Shibayama Zenkei (1894-1974): The Gateless Barrier: Zen Comments on the Mumonkan, Boston : Shambhala, 2000. Originally published: Zen comments on the Mumonkan. New York : Harper &​ Row, 1974. No barrier: unlocking the Zen koan: a new translation of the Zen classic Wumenguan [Mumonkan] /​ [by Wumen Huikai]; translated from the Chinese and commentary by Thomas Cleary. London: Aquarian/​Thorsons, 1993. xxiii, 213 p.
Albert Low, The World a Gateway: Commentaries on the Mumonkan, Boston: Charles Tuttle, 1995. Das Wu-Men-Kuan, oder "Der Pass ohne Tor," ubersetzt und erklart von Heinrich Dumoulin, S. J. (Tokyo: Sophia University Press [Jochi Daigaku], 1953), 64 pages. A painstaking German translation with copious footnotes, interpretations of the meaning of each koan, and an interesting introduction, in which will be found the biography of Wu-men Hui-k'ai and also that of his Japanese disciple, Shinchi Kakushin (心地覺心 1207-1298), who first brought the book to Japan, The translator's interpretations of the import of the Koans are questionable. Éd. Points. 2014, 272 p.